Austin Steele's New Life on Xova is available for purchase in softcover on Amazon.com. It's also available for Kindle e-book on Amazon.com. BILLIONAIRE AUSTIN STEELE is suddenly faced with a terminal brain tumor. Among his holdings is a space lab and launch complex in Texas. A breakthrough in rocket technology at his lab enables space travel at near light speed, providing him the opportunity to fulfill his childhood dream of going into space. The only catch is he’ll be dead! Hundreds of years later his spacecraft is discovered by an alien race in the Alpha Centauri System. 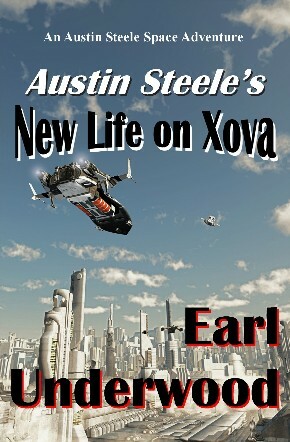 Austin is given new life and embarks on exciting adventures on the planet Xova. Earl Underwood brings you a cast of vivid and compelling characters that will take you through a wide range of emotions. You won’t want to miss the ending of this action-packed adventure. [A] feel-good story, fast paced and never boring. It keeps you checking yourself as to how you are conducting your life − are you being grateful to your loved ones? Loved the book. Would recommend it to all my friends. It made me cry, it made me laugh, and I couldn't put the book down. I read the whole thing in one day. What a wonderful read. Waiting on the next book. While science fiction usually isn't my genre of choice, I decided to read this out of curiosity. I have never been more pleasantly surprised with a book. The author obviously did a great deal of research, and I found that he sprinkled his findings in an engaging and entertaining manner that kept me captivated throughout the book…the imagination and creativity needed to craft such a work is bordering on genius, and I look forward to reading more from Mr. Underwood. The story was gripping and drew me right in to where I couldn't put it down. I enjoyed the humor and storyline. A fantastic escape from reality! I can't wait to read more from this author. This book was wonderful! It grabbed me from page 1 all the way to the end. I could barely put it down once I started. Mr. Underwood did a great job bringing this story to life with the characters and descriptions. I certainly recommend this book to everyone who loves science fiction. I am waiting excitedly for the next Austin Steele Adventure! This book was engaging from the start. The characters become a part of your family, and you get excited about what might happen next.